Below are different topics which detail what kind of technological amenities we do and do not offer at our funeral home. 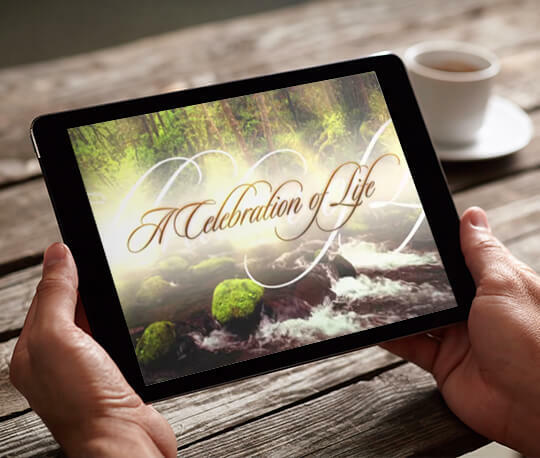 There are also detailed instructions on how to make different kinds of memorial slideshows or memorial videos for your loved one if you wish to do so and what we need from you in order to display those things at our funeral home. Please feel free to call our office if you have any questions or concerns. 1. Create a new, empty folder on a USB drive named after the decedent. 2. Put as many photos as you would like into the folder. 3. Allphotos used must be .JPG FORMAT- even 1 photo in the folder that is not .jpg format will render the entire folder useless for our television monitor to process. 4. The television will automatically show the pictures as a slideshow once we put in the USB. 5. The family is always welcome to come 30 minutes ahead of the first viewing/visitation/service scheduled in order to set up the slideshow on our television. 6. Please ALWAYS bring in a computer and computer charging cord just in case we need to use it as a backup. Other Types of Slideshows or Video Instructions and Resources: Powerpoint, Animoto, ect. · If you would like to make another kind of memorial video or slideshow, please feel free to do so! All we need in order to put it on the TV Monitor is for you to bring in your computer and computer charger. · We have computer input/output connection cords for PC computers as well as Apple computers and iPads. · The family is always welcome to come 30 minutes ahead of the first viewing/visitation/service scheduled in order to set up the slideshow or video on our television.